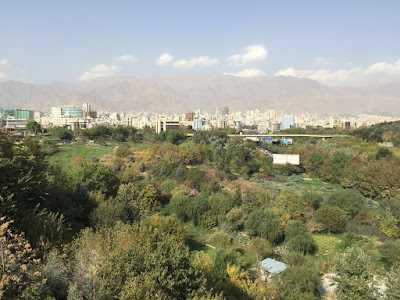 My last running blog goes back to the running events in Afghanistan, while advising the government on urban planning issues for Kabul, its capital metropolis. This was end 2015. Since then I did not engage in competitive racing anymore, so I thought there was nothing to share and to inspire. People only take inspiration from winners and good mood stories I thought, knowing deep inside it’s not entirely true. 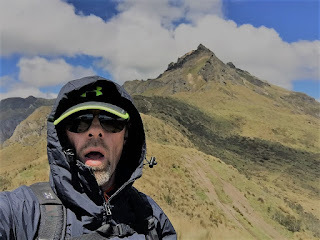 The truth is that I simply did not have the courage to accept life-changes that busted the running bubble I was inhabiting for the last decade, since I started running back in 2005. Since my first marathon in Radenska/Slovenia in 2007, my running and overall fitness performance curve remained in the uphill mode with some hard-fought achievements on the marathon and ultra-marathon distances - until you realise you can’t keep up the appearances anymore. Main reason: the last two years my heart was seriously beaten up. - By the ‘election’ of Trump of course, and seeing this real-estate mogul trampling the constitution and international conventions, as well repealing the few progressive civil right legacies of the Obama administration. – By the downfall of social-democracy and reason in Europe, my home-continent. – By EU’s financial failures in general and the ‘financial waterboarding’ of my home-country Greece in particular – a testing ground for ‘hyper-austerity’ as Yannis Varofakis accurately framed it. – By the rapid environmental degradation of the blue planet and its protective shield, jeopardising future generations and the invaluable biodiversity. – By religious 'fanatism' of all kinds spreading as a cancer throughout humanity, trampling the merits of science and common sense. But in all honesty – at a personal level – most by some family and health kickbacks, including the death of my father (albeit in a very peaceful and remarkable way); a permanently mutilated shoulder (thanks to an unfriendly encounter with a brainless driver in my home-city Athens, parking his car on the pavement I was running); permanent ear damage or tinnitus (thanks to a popping ear during one of my long-haul flights to China last year) and last but not least Arrhythmia or Atrial Fibrillation (AFib) of the heart. 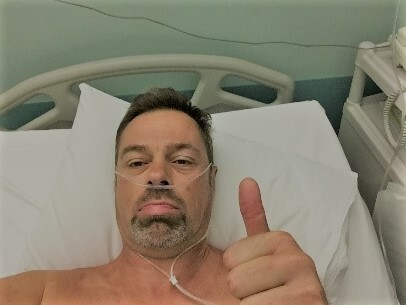 This ‘heart-injury’ - a runners most important muscle - was first diagnosed in highly polluted and overstressed Kabul/Afghanistan after the last races I reported on. 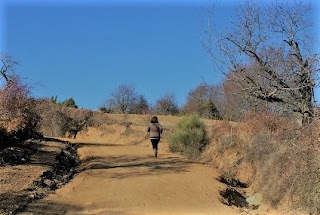 The arrhythmic beating of the heart goes with an overall higher pulse - beating up my heart literally to a point that stripped my running abilities to jogging level – something I thought I would never surrender to. My heart doctor advised not to run/walk more than 5-10k! After a period of denial, I just had to settle for a more sporadic and non-competitive jogging life, joining the growing league of ‘young AFib-ers’ that might be co-induced by intensive sporting. My decade-old mantra ‘Run to Live’ needed a humiliating but life-saving update: ‘Jog to Live’. But there was also excitement the past two years. - Excitement to draft a global handbook on the application of the International Planning Guidelines (tampered by the uncertainty of publication). - Excitement to experience the birth of a first and healthy granddaughter (tampered by the realisation of my own ageing). 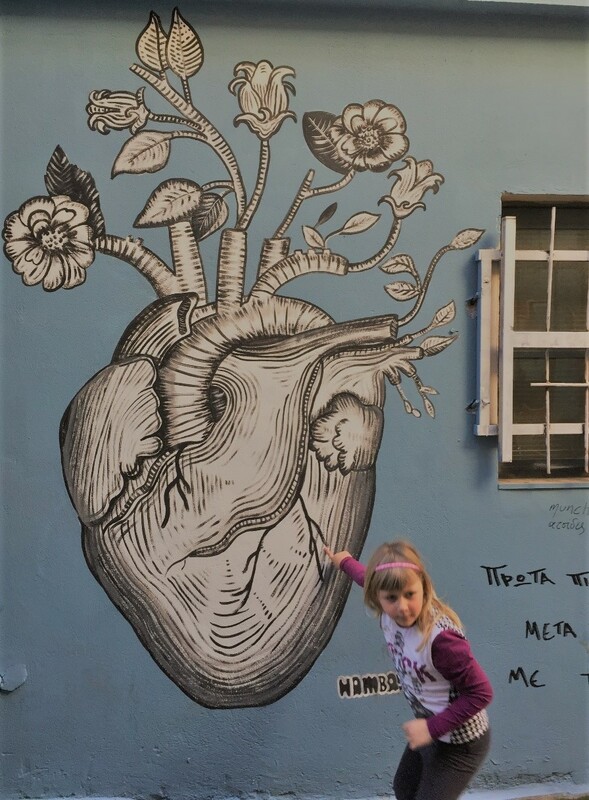 – Excitement to see my youngest daughter ‘graduating’ from pre-school followed by entering the first grade in the local municipal school (tampered by worries about the educational downfall in Greece). 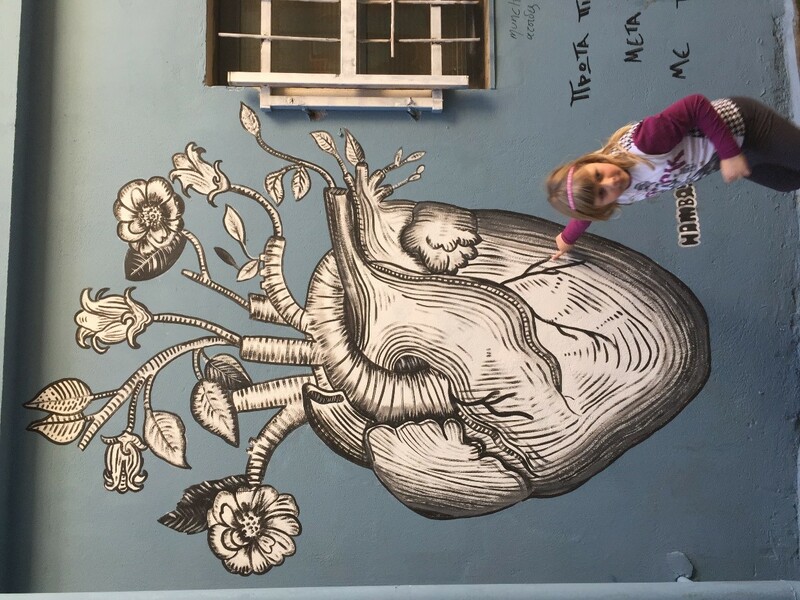 – Excitement to spend more time with my lovely spouse and daughter at home in Athens (tampered by the degradation of street-life-quality in our neighbourhood). – Excitement to transform our flat roof into a green paradise enjoyed by many friends and family members. – Excitement to host my son and his girlfriend, my sister and her husband, and finally my widow mom, sharing my preferred city gems with them in Athens and Attica region. – Excitement to undertake some new professional adventures by travelling and advising countries from China over the Arabian Peninsula and Africa to the Caribbean and the USA, ending 2016 with the active participation in the Habitat III Summit in Quito/Ecuador and ending 2017 with a keynote lecture at the Balkan Architectural Biennial in Belgrade - and winning an award for work done in Wuhan/China (overall tampered by a downfall in income and job security as free-lance consultant). – And even excitement to watch Trevor Noah, Stephen Colbert, John Oliver and the likes testing the first amendment of free speech against Orange Hitler in the White (Nationalist) House. But in all honesty again – at a personal level – the greatest excitement of all was the successful ablation (operation) of my heart, by forcibly restoring the rhythmic and low pulse beating of the heart. While a first electro-shock intervention early last year failed, a more serious ablation was executed during the summer, complemented by a medication regime to keep the heart in check – so far so good. 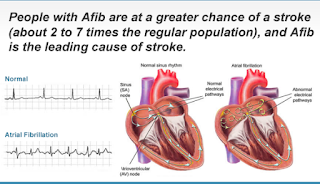 Did I really abstain from running altogether since the diagnosis of Afib/Arrhythmia? Of course not. In 2016, against my doctors advise, my longest running race was the Athens Classic Marathon, albeit in walk/run mode and finishing in a time just under 5 hours, 2 hours slower than my best time on that course in 2009. But given the difficulty of running with elevated heart pulse (up to 200 bpm at low running speeds), it felt like a victory of mind over heart. Apart from this ‘major race’ I only engaged in the Chios Half Marathon in 2016 – further reduced to the Chios 10k in 2017. 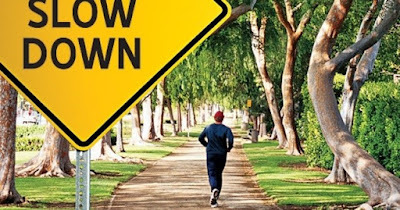 During Afib I could not run any hill, do any interval workout or even run non-stop for much longer than 5k, especially under hot/humid weather conditions. Not easy for a guy who ran a sub-3-hour marathon and a 180km non-stop mountain race in 20 hours-some. A memorable moment though during the Afib period occurred during a city run in Tehran/Iran, while attending a conference as ambassador of ISOCARP (International Society of City and Regional Planners). When cresting a hill in a nearby park, struggling to sustain the running mode, I suddenly felt a surge and flew up the mountain and all the way back to my hotel. After measuring my pulse, I realised I had relapsed into ‘rhythmia’ and out of Afib, in a natural way. Some days later however, while cresting a longer and higher hill back home, I relapsed back into Afib and felt like Icarus as he approached the sun with his waxed wings and fell back to earth. My joy was short-lived. And yet, I kept on running whenever and wherever possible. 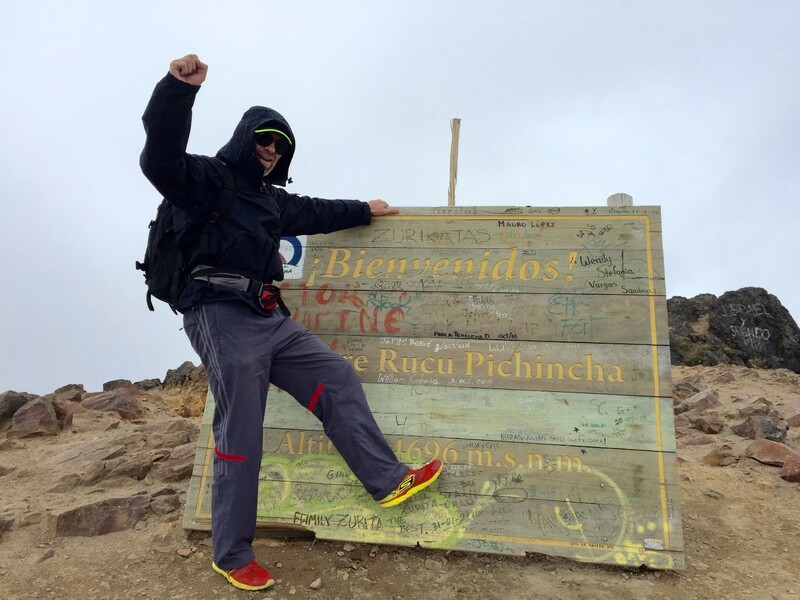 Often more out of fear or remorse for the expanding waistline than out of pure joy as previously experienced – the ‘runners-high’ was on a record low these days! After my last successful races in Afghanistan, a second place in the Bamyan Marathon and a first place in the Kabul 24h Marathon (in a multi-storey building! ), I ran or jogged – I consider running at speeds of 10k/h and more - much shorter distances in all places I have travelled and lived since then: Dubai, Nairobi, Kenya’s Rift Valley, Minsk, Antwerp, Durban, Wuhan, Bogota, Quito, Athens, Willemstad, St Lucia, Kingstown, Chios, Shanghai, Abu Dhabi, Portland and Belgrade. I ran with heath, rain and frost. I ran until I had to walk and walked until I could run again, with average speeds below 10k/h, so technically no running at all. 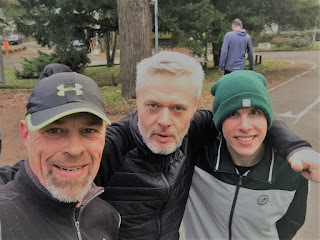 Through social media, I kept following my running friends their enduring and inspiring races and achievements, with a mix of admiration and jealousy. There were days I was in peace with the Afib state of running; overruled on other days with anger and disillusion. 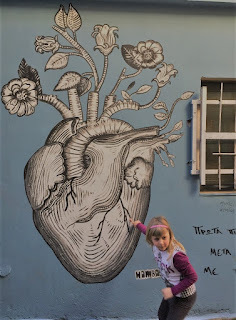 This thus changed with the successful ablation of my heart in an Athens private hospital, taking the risk of a substantial out-of-pocket financial investment. The intervention lasted some hours and resulted in burning/freezing ‘tattoos’ around the synapses of the heart, to deflect the ‘bad’ electrical signals causing the arrhythmia (and also ‘heart flutter’ as they discovered during the operation). The operation was declared technically successful, but it remained to be seen if the heart would stay into rhythm of relapse into Afib again. Daily medication for the next 6-12 months should support the status quo, with the side effect of reducing my VO2 Max or lactate threshold – practically capping my pulse in the medium range. This ablation happened in July 2017 and now we are 6 months further down the line and so far, so good. After a recovery period of a month I started rebuilding my lost running fitness on the island of Chios, a wonderful place to run, bike and swim, culminating in finishing the local 10k race in less than 60’, meaning it was a run and not a jog! A small but meaningful achievement. Upon my doctor’s recommendation I kept running distances and speeds at bay, not to provoke a relapse into the fold. Yet I could finally enjoy running again and go out more often. 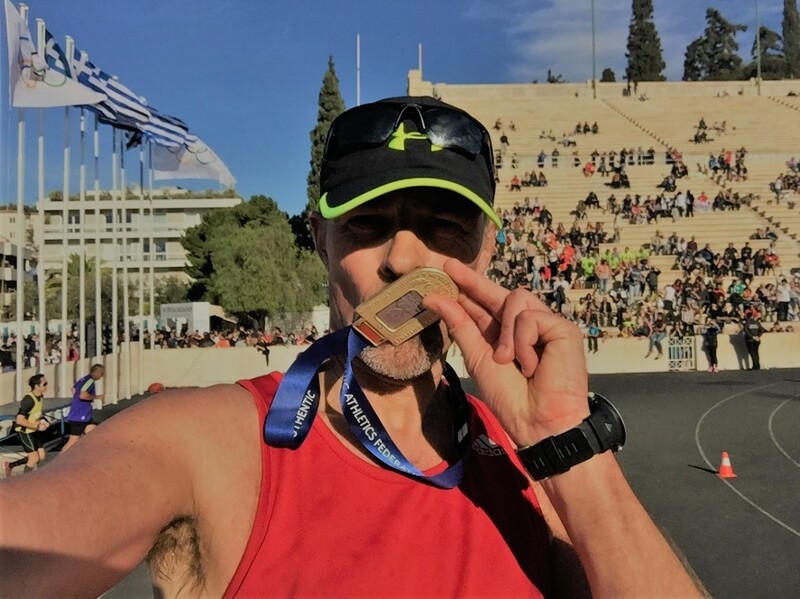 Without pushing too hard, I could finish a second 10k race, here in Athens, in 53’. Slow compared to my best-time of 38’ but better than in Chios and a PR since Afib-diagnosis. 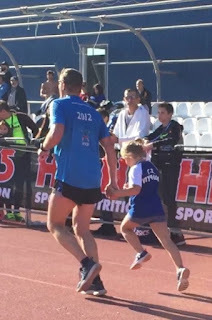 Even more glorious was crossing that finish line in the Agios Kosmas Stadium together with my youngest daughter Xenia, who earned her very first 2k race medal at age 6. 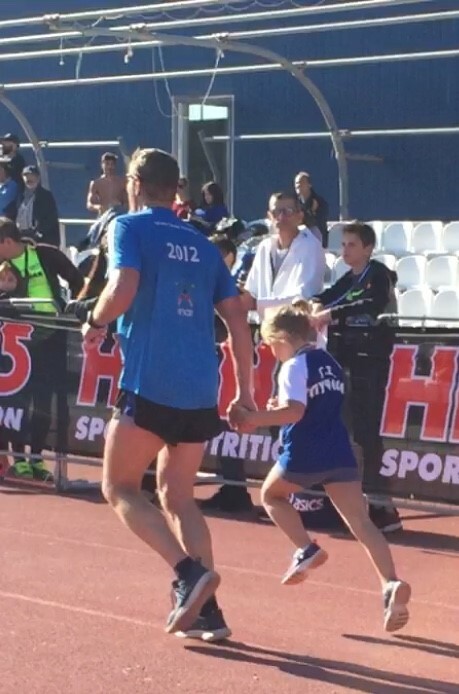 Xenia is training 4 times/week – two days running and two days gymnastics – passing the baton to the next generation. 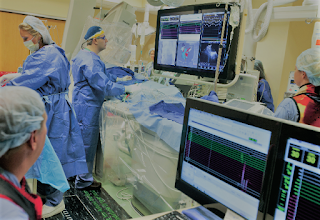 Of the non-competitive training runs since the heart ablation – and apart from the aforementioned runs in Tehran and Chios, four stand out in this difficult period - Glyfada, Portland, Belgrade and Chortiatis/Thessaloniki. 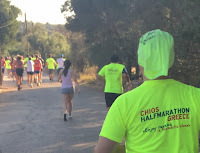 In Glyfada, my home-city in the Athens metropolis, I ran countless runs but the one with Martin Cordoba stands out because it brought back the special memories to the Spartathlon race, possibly the most enduring foot-race on this globe. 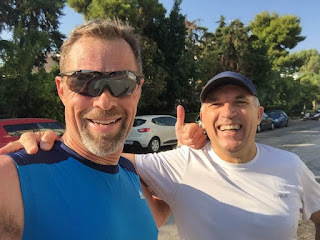 I attempted twice to cover the 246k-long race from Athens to Sparta, but failed – mainly due my inability to run with heath. It was a watershed-race in the sense I finally found my limit, something my body could not digest. Of course, I could have tried again and again, but instead I accepted the red line, maybe because my heart was already sending coded messages, who knows. The day before the 2017 edition of the Spartathlon, I caught up with age- and soulmate Martin Cordoba, a passionate ultrarunner from Argentine, who achieved two completed races out of five attempts. This was his sixth participation and eager to get the balance right. He accepted my invitation for a last training run the day before the great day. We ran 10k and I hardly noticed the time or distance while talking the way ultra-runners do: about everything and nothing. To my great amusement and admiration, two days later, Martin crossed the finish line for the third time. I ran the entire distance on his side in the virtual world. 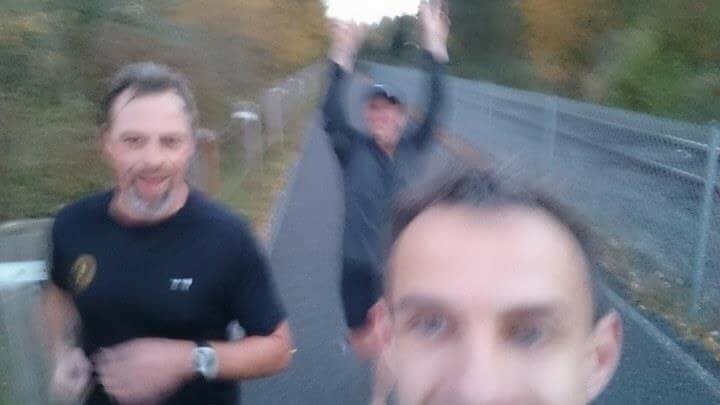 In Oregon Portland (USA), while attending the World Congress of ISOCARP on ‘Smart Communities’ last Septem,ber, I enjoyed a 20k run with a Canadian and Polish friend/partner in crime. 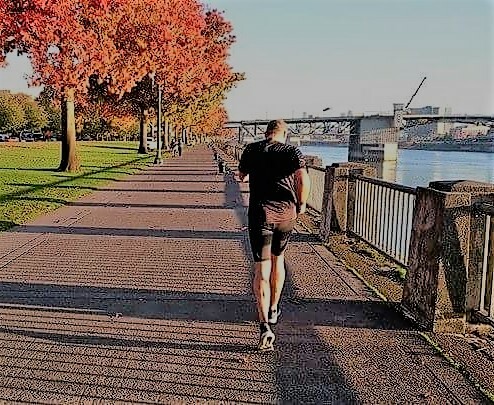 We ran at dawn with crisp air and blue skies along both sides of the Willamette river that runs through Oregon/Portland. Despite being seriously undertrained and overweight I felt like running in my better days, finishing fresh and ready for a long day of speeches and events. With Michael and Slavek I also share a passion for comparing runnable cities and writing about it. With Michael I co-authored an article on Running Wuhan, soon to be published in a magazine. Running with running soulmates is great and running with professional running soulmates is a real blessing. Portland proved to be a quite runnable city, making the transition from car- to people-centric city I would like to see happen one day in my home town Athens – currently a sacred place for motorized four- and two-wheelers. 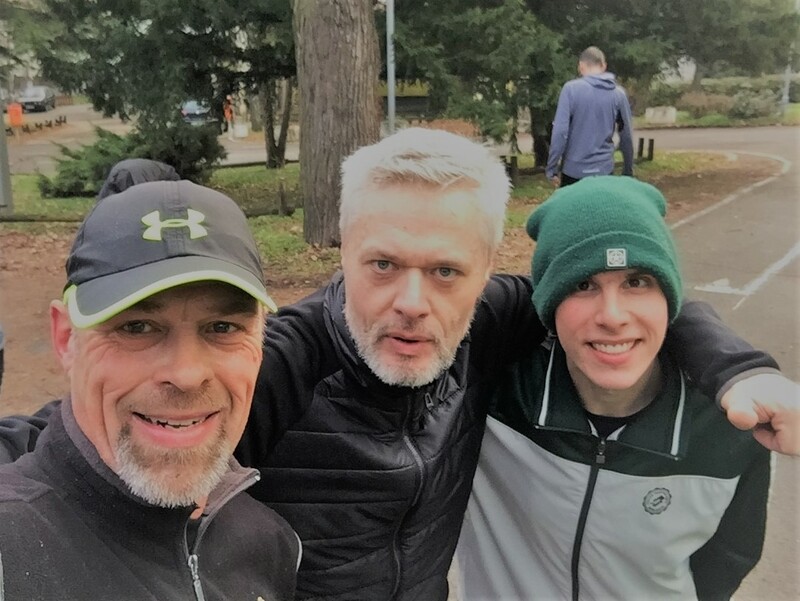 Running in Portland reminded me of my Boston Marathon – the year of the pressure-cook-attack – and the joyful training and recovery runs along the Charles river. Runnable cities are just great for everyone! 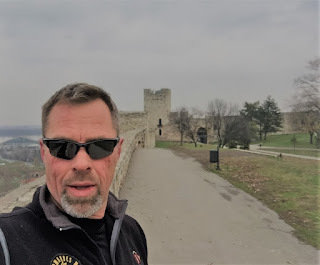 In Belgrade, where I attended the Balkan Architectural Biennale, I had the chance to run along the Sava and Danube river, from and to the old city district, through the famous Kalemegdan city park with its medieval fortress. But most of all I was thrilled by a train run in the metropolitan forest park just outside the core-city. On a crispy Saturday morning I joined the Belgrade Runners Club to run a 10k loop in the muddy forest, ending 3rd place in a competitive training run. The 3rd place is in this case totally irrelevant but being able to maintain a certain pace on the uphill’s is no less than a great feeling since the heart ablation. 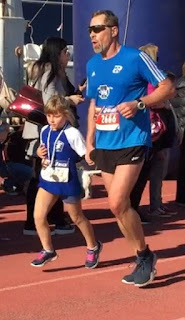 Also, the spirit among the Belgrade runners, in a society drained by socio-economic downfall and backward nationalism, was more than heart-warming and promising for the future of this beaten up Balkan city. If both Belgrade and Athens, the two main Balkan cities could learn from e.g. Portland how to turn down toxic cigarettes and cars, I would be glad to ad a Balkan tier to my already multi-layered identity. Of cigarettes and cars I did not suffer on my last run of last year, a 35k hike/run from the valley to the peak of Chortiatis Mountain northeast of Thessaloniki, Greece’s second largest city. The day before I seduced my spouse to undertake a 16k reconnaissance hike to the refuge just under the peak, rewarded by a great meal around the fireplace. The next day I doubled the distance in a walking and running mode, not to trigger a relapse I would definitely regret, with blue skies and a caressing sun, awarded by a superb mountain view overlooking Thessaloniki city and bay all the way up to the sacred Olympus Mountain, which I have crested and raced multiple times. I arrived back in the valley at the time of a sunset combined with a rising orange supermoon – magic and a happy end of my longest walk/run of 2017. 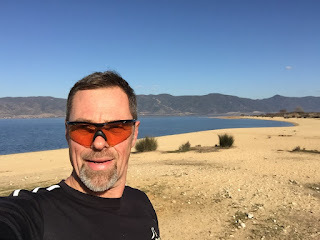 Two days later, I started the new running year with a beautiful 12k run at Volvi lake, at the base of Chortiatis mountain, rewarded by a rejuvenating thermal spa-treatment in Apollonia. The new year could not start better. So, on a final note I could say ‘we’re back on track’, albeit in some different modus. I am saddened by the realisation there is no way back to the previous level and running life, not of racing my beloved marathons let alone ultra’s, but its good and important to set new goals and ambitions within my healthy perimeter. As I long as I can run, I exists. What will 2018 bring? We don’t know but it helps to be ready and open-minded to seize opportunities within reach. Meanwhile, let’s hope all the world problems will be solved in 2018. Have a good year too!